Vegan Recipes - 3 Minute Chocolate Cake! WOW - an old trick I used to use to make girl's knees go wobbly. I was reminded by an email about a dreadful 5 Minute Chocolate cake. This one is light and fluffy and ADDICTIVE so beware. 1 minute to mix - 1 minute to cook and 1 minute to stand = 3 minutes! Mix thouroughly with a teaspoon. Microwave on full power (900-1000w) for 1 minute. Add a spoonfull of ice cream and eat straight from the mug. Use this delicious light fluffy chocolate cake recipe carefully or it could change your life and your waistline. I hope everyone is now aware of how important essential fats are for the integrity of every cell membrane in the body and also the difficulties of processing omega 3 flax oil into the important omega 3 long chain fatty acid EPA in the body. Now there is Echium oil in the form of Echiomega an SDA rich oil with GLA that is claimed to provide 300mg of EPA from 1 gram of Echium oil and is 5 times more effective at conversion than omega 3 ALA rich flax oil. The Producers from The Simpsons have revealed they are keen to have US President Barack Obama and UK Essex Comedian Russell Brand on The Simpsons legendary long running comedy cartoon series. Brand won't be the first famous vegetarian. Paul and Linda McCartney once appeared in The Simpsons to help Lisa go vegetarian. Heather Mills, Sir Paul McCartney's ex wife has just signed a deal with BK Burger King to promote the new BK vegan veggie Whopper burger for £4.3 million pounds. This is a little bit of a poke in the eye for The Vegetarian Society who allegedly get less than a half a per cent of that amount for promoting the McDonalds vegetarian option despite having the backing of Sir Paul McCartney himself. Heather is notoriously generous on animal rights issues and it's hoped a percentage of that fee will find it's way in supporting vegan campaigns in the UK and around the world. Thousands of people attended the Brighton Vegan Festival on Saturday despite the distraction of the glorious sunny seaside weather. Having bought a new vegan cafe in nearby Hove it was hoped Heather Mills would attend but she was clearly preparing for mothers day with Beatrice. SSOV Blog - Our Camden Shop - Opening this weekend! 2) The opening of The Secret Society of Vegans (shhhh don't tell a soul) fantasmagorical new shop in Camden. The choice is yours but you only have 2 choices OK? O'Kaaaay? Lady Heather Mills-McCartney probably back to Heather Mills now she is divorced plans to open a vegetarian seaside cafe in Brighton - well the next town on - Hove. Animal Rights campaigner and strict Vegan, Heather 41 has taken over the Big Fish café in Hove, East Sussex. Heather Mills used to eat there with Paul McCartney and their daughter Beatrice before the couple's divorce. "They'd have veggie breakfasts and soya milk tea," says the previous owner of the big fish café Nick Short. "Heather said she'd like to buy the place if it came on the market." The sale went through with Heather Mills on Friday for £140,000 – £115,000 less than the original pre recession price of £255,000 Heather had allegedly originally verbally agreed to pay for the business. Heather apparently plans to renovate the property and turn it into 100% vegan cafe restaurant removing all meat fish and other animal products from the menu. It's thought Heather Mills and her daughter Beatrice may pop into the Brighton Vegan Fayre in The Brighton Centre on Saturday 21st March to get ideas for her new menu. There will be a big emphasis on healthy food at The Brighton Vegan Food and something for everyone with a cowboy style fast food bar, Vegan pirate salads and smoothies and a gourmet Penthouse restaurant in the Skyline with impressive views out to sea. Surprises such as vegan fish and chips , vegan steak salad, Vegan Sausage and Mash as well as some delicious traditional style fresh vegetable, nut and bean dishes will open people's eyes to the full potential of a healthy, sustainable, ethical vegan lifestyle. 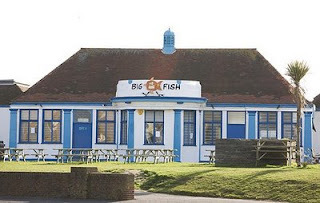 Best suggestions so far for the new name of Heather Mills Seaside Cafe in Brighton is to change it from 'Big Fish' to 'Big Wish' or 'Small Fry' - 'Windy Miller's' is our top tip. Natalie Portman clearly has bare naked ambition on women's rights issues, I wonder what she is doing for Mother's Day?